By itself, this dish makes a great side to serve with fish or meats. You can also turn it into a vegetarian entrée by tossing the cooked zucchini with pasta, a slug of olive oil, and lots of freshly grated Parmesan cheese. 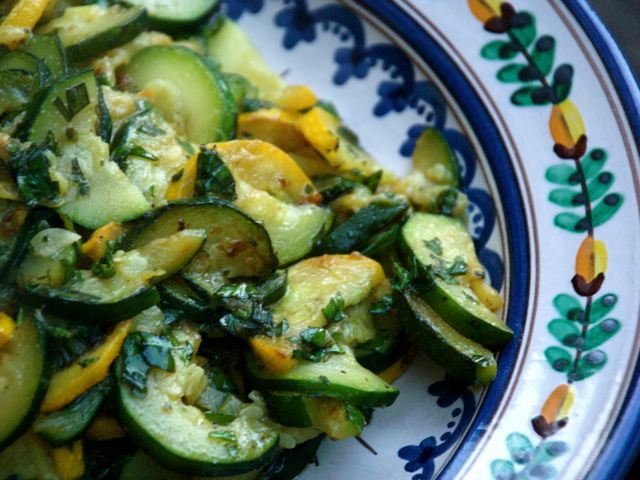 Or, add a couple of eggs to the sautéed zucchini for a delicious omelette or frittata. Heat the olive oil in a large sauté pan. Add the garlic and stir, then add the sliced zucchini. Cook over medium heat, stirring often, until the zucchini is soft and beginning to brown. Season to taste with salt and pepper. Toss with the chopped basil and serve.